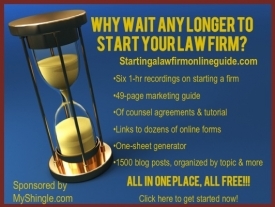 Legal subscription plan – that is, a services or bundle of services available for a fixed price on a recurring basis — can be a solo or small firm lawyer’s best friend. As I wrote almost a decade ago, subscription services create a steady stream of revenue that can help even out the cash flow roller coaster that most small businesses experience and keep your firm on your client’s radar through constant contact. Yet despite the benefits of subscription services, many lawyers shy away from them because they can’t figure out how to price them. Most lawyers I’ve spoken with are most concerned about the consequences of underpricing a service – for example, receiving 20 emails daily from a client who’s paid for a $300/month service for unlimited communications with an attorney. Of course, to counteract the prospect of underpricing, some lawyers don’t offer a discount for subscription services at all which is what makes them valuable to clients – for example a $1500/month plan for 5 hours of legal services which comes to $300/hour which is the same as the lawyer’s ordinary rate. SAAS industry which grapples with pricing on a daily basis. And that’s why The Ultimate Software as a Service Pricing Guide is such a reat resource for lawyer who want to offer legal subscription plans but haven’t done so because they couldn’t figure out pricing, or have offered plans that never gained traction because they weren’t prudently priced. There’s a lot of material to go through but the modules that I’ve found most useful are Twenty Best Pricing Practices, Picking A Pricing Strategy , Low Touch and High Touch SAAS Models (information on conversion rates and strategies for harder-to-sell subscription services) and Psychological Studies on Pricing. Have you ever offered a subscription service and if so, has it been a success? If you haven’t offered a subscription service, why not? Share your responses below.